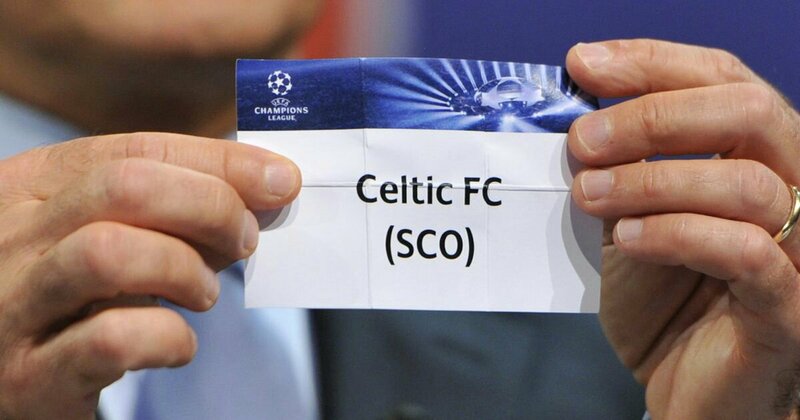 Celtic avoided a group of death in yesterday’s Champions League draw. Thankfully they also avoided Barcelona. Each of their opponents come with their own challenge. In the past Celtic have faced each of these teams home and away once in European competition. From Pot 1 came Bayern Munich. Now let’s not beat about the bush, they are a formidable team with a well respected manager. Celtic lost in Munich 2-1 in 2003 followed by a 0-0 draw at Celtic Park, both matches being played in the group stage of the Champions League. Bayern were a good team back then, but they are far superior now. The five-in-a-row Bundesliga Champions made the quarter finals of the Champions League last season. It was only after extra time that they lost out to eventual Champions, Real Madrid. I’m pleased to be playing them after such a long time. It will be a tough test for Celtic, but that’s why we’re in this competition. Out of Pot 2 came Paris Saint Germain. The last time Celtic faced them was in the Cup Winners Cup in 1995. Back then both games were won by PSG. They slaughtered Celtic 0-3 at Celtic Park and 1-0 at Parc Des Princes. That was a team that included some pretty amazing players. The current PSG side is pretty glamorous to say the least with Neymar top of that list. Last season PSG made the last sixteen of the Champions League. They hammered Barcelona 4-0 in Paris but lost the away leg 6-1 and the tie 5-6. In Pot 3 Celtic drew Anderlecht. They are Celtic’s best chance at getting points. Celtic last played the Belgians in 2003 in the same group with Bayern Munich. Celtic were beaten by ten man Anderlecht 1-0 but the home tie was won convincingly 3-1 by the Hoops allowing them to finish third and parachute into the UEFA Cup where they reached the quarter finals. Anderlecht cannot be underestimated though because they are in this competition on merit. They made the quarter finals of the Europa League last season, losing out to eventual winners Manchester United. So Celtic have their work cut out for themselves. If ever there was a reason to invest in a couple of more players then this is it. Injuries have left Brendan Rodgers selections threadbare this season. Against these clubs Celtic will get annihilated playing without a proper striker or central defensive pairing. It will be tough to recruit quality and experience for the right price. There is also a necessity to find it before next week’s deadline. Rivaldo Coetzee is supposed to have signed already, but that has not been confirmed by Celtic. At 20 years of age he may not be seen as the immediate answer. He has played for South Africa more than twenty times. So there is some international experience in there for him. So far the Patrick Roberts story goes on. If this was going to be a loan deal I would imagine it would have been sealed by now. Therefore it is more likely that Celtic are trying to bring him in on a permanent deal with umpteen clauses just to satisfy Manchester City. That’s where the delay is most likely to be. Brendan still needs another striker and defender. Even on loan deals if need be. We have an exciting tournament starting next month. Let’s tool up for it. With a 5-0 lead in the bag, I didn’t expect to have my heart in mouth last night. And yet that’s just what happened as the second leg wore on in Astana. I wasn’t nervous going into this match. As the second half progressed I began to get that horrible feeling. You know the one I mean right? Where Celtic throw it all away? As it turned out we didn’t, but Astana gave it a right good go. Celtic also helped them give it a right good go. Up until half-time I was quite pleased with the flow of the game. After the interval Celtic were all over the place. Gordon was flapping in goal, the whole defence looked rattled and the midfield (with the exception of Ntcham) were all over the place. The encouragement Astana were getting gave them a much needed boost. Despite the narrow 4-3 defeat on the night it was of course an 8-4 win for Celtic overall. At 4-1 it was pretty nervy. The bottom line is of course that Celtic scored more goals than Astana. It has also highlighted the fragility of our defence with key players missing. In the group stage Celtic would have got slaughtered. With Boyata and Simunovic in there I would feel more comfortable but they still need backup or even competition. Ajer may be a long term project, but Bitton isn’t. Despite a steady showing at Celtic Park against Astana, he was awful last night. Bitton is a midfielder who is zero pace and likes time on the ball. Threaten that and you might just get yourself a goal. Ajer will learn nothing playing alongside him in defence. Given the injury situation, these guys have had to step in, but I think Brendan Rodgers may have been pushing that a little bit too far last night. He must now realise that to better last seasons showing in the Champions League we need to invest at the back as well as up front. The transfer window remains open and Celtic have sone money to spend. Tomorrow we will learn our fate as the groups are drawn. Celtic are currently in Pot 4 with their only chance up stepping up to Pot 3 being a Liverpool defeat at home tonight. I’m not waiting for that result. We’re going to get a tough draw be it Pot 3 or Pot 4 we’re in. At the end of the day, we’re here to rub shoulders with the best. All I ask is to avoid some of the teams we’ve played too often like Barcelona. I’d love to get an English club. Would be an interesting encounter. We’ll see what tomorrow brings. At least we’re in the hat! Celtic’s recent use of youth is not confined to home-grown talent. Brendan Rodgers has invested in young talent south of the border and overseas. Moussa Dembele was the first young player the manager got the club to part money with. Since then he has recruited Eboue Kouassi, Kundai Benyu and Olivier Ntcham. And it is the latter of the three that this blog is about. Despite being only 21-years-old, the French midfielder is bursting with talent. On the ball he looks as though he’s been playing the game for years. The way Ntcham threads the passes must be enviable to some players already in the squad. I recall in Ronny Deila’s last season that Scott Brown could barely complete a pass. Whilst some of that may have been down to injury, confidence or the general mood of the team at the time, Ntcham looks extremely comfortable on the ball. There’s no doubt that his two season loan spell at Genoa has allowed him to gain the experience that Manchester City did not. However, you must have the skills to do the job as well. So far Ntcham is making it extremely difficult for Brendan Rodgers leave him out. On his recent displyas the only thing that will allow others to get a game is the rotation of the midfield. Scott Brown will play week-in week-out as club captain and on his own personal form and influence you would not argue either. With players such as Callum McGregor, Tom Rogic, Nir Bitton, Eboue Kouassi and Stuart Armstrong also vying for a starting slot, the midfield is pretty strong. 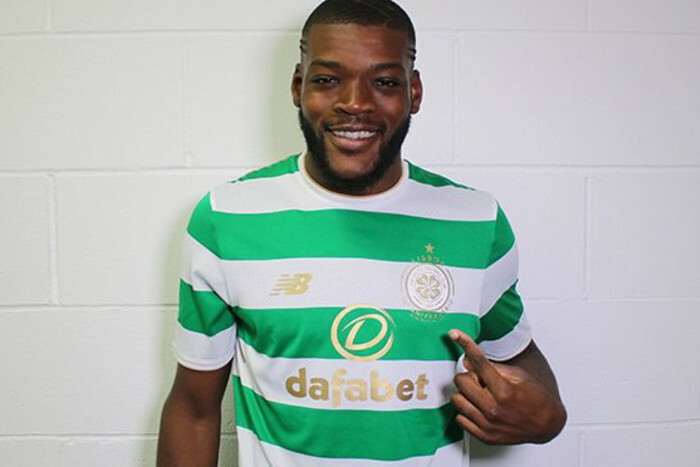 For Olivier Ntcham to come in, get his name in starting lineups and make such an impact makes him a key player. I look forward to seeing what this kid can do because so far it has been encouraging to watch. It’s not often Celtic have gone into an away second leg playoff tie with a scoreline like 5-0 in their luggage. In fact has it ever been done? I’m not even sure what to do in this type of scenario. Do you sit back and contain or go out and try to win the game? We’ve been humbled in Europe by smaller or unknown teams over the years with similar results. If you’re of the correct age you’ll still bear the scars. I think it is fair to say that most fans were surprised by the 5-0 scoreline last week. It was a close encounter with Astana last year so a 2-0 or 3-0 would have been more than satisfactory for the everyone. There were some notable individual performances at Celtic Park. Overall it wasn’t a walk in the park. The team had to grind out those goals and got a rare rub of the green into the bargain. That sort of luck has eluded our club in Europe more times than I care to mention. We must take confidence from that because the players never gave up. The team work was admirable. 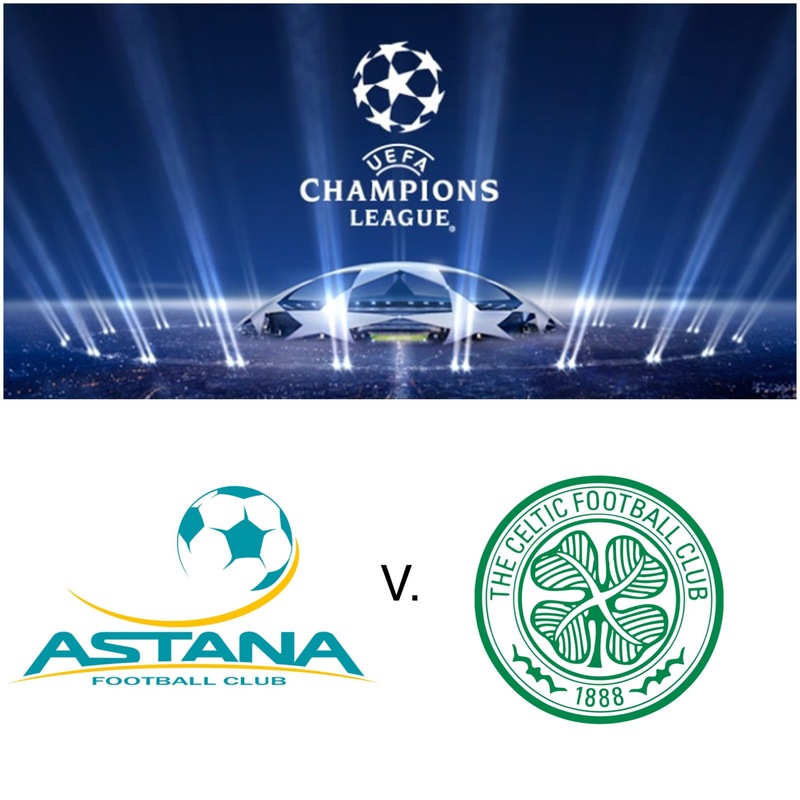 Whilst Astana had thrown in the towel, Celtic kept going. It is that sort of effort that will serve us well in Europe. Tonight we need more of the same. In the media, Astana’s head coach has already conceded the tie, but Celtic won’t be taking anything for granted. It isn’t impossible to overturn such a margin. Celtic have come close to doing so themselves in the past. So there is no way in the world that Brendan Rodgers will go into this one unprepared. Celtic still need to work hard in Europe and doing so away from home this evening will be an invaluable exercise for the rest of the European campaign. When you shuffle the pack, you get a different challenge. Once again, Brendan Rodgers gave youth a chance. Celtic’s 0-2 victory at Rugby Park yesterday was another step toward a long unbeaten run that goes way back to last year. He did so by swapping out six players from the midweek thumping of Astana. With the Champions League group participation all but confirmed, Brendan Rodgers is almost certain to see that run comes to an end against one of Europe’s high rollers. The last team to beat Celtic was Barcelona on 23rd November 2016 in the Champions league. However, Brendan is now showing his willingness to play youth. After an invincible season where he ran the rule over the inflated first team numbers he inherited, he has a new challenge at the club. Celtic have a very successful talent pool but the yield isn’t always bursting at the seams. We’ve had many introductions over the years though few have held down a regular first team spot. Kieran Tierney and Callum McGregor are the two standouts in the past few years. We’ve also seen guys like Liam Henderson for a similar if not longer period of time but he has struggled to impose himself in a talented and busy midfield. Other players to get competitive first team time are Jamie McCart and Jack Aitchison. They remain part of the Development Team, but both have demonstrated their worth. Whilst this might not be a team you’d field every week or in the Champions League, I’m certain that it could overturn several Scottish Premiership clubs. I don’t think that’s an unrealistic view given the current standard of football that Celtic come up against. The future continues to look bright for Celtic. You just won’t read about it in the SMSM. Many have already uttered their feelings about Celtic’s success in Europe having a negative effect on the rest of the game. Baffling to say the least. Apparently Celtic’s dominance, despite using fair play, is unhealthy for the game. They didn’t say that when Rangers 1872 bought their way to success under Sir David Murray. A period where Celtic could not compete financially or on the field of play as other teams of the time like Aberdeen and Motherwell demonstrated. Eventually the tide would turn as Celtic got their house in order. Some twenty odd years later, our club is flourishing. From youth through senior level. As a business we are running like a well tuned engine. We have a top drawer manager into the bargain. Why should Celtic be criticised for doing it right? Other clubs had the opportunity to step over Celtic, but they didn’t. It seems many people out there envy our club. We cannot be criticised for doing it right. If anything other clubs should be trying to emulate what Celtic have been doing. Whilst it does require prudence and working within your means you need some sort investment to get up and running. So big Stu has signed a new two-deal-year for Celtic. Good news for both parties. Many will see this two-year-deal as a one-year-extension. The expectancy would be to sell Armstrong next summer with one year left to run. However, I’ve got a different take on this. What if he’s been given a transitional deal to allow both parties to come back to the table at the end of the season? It’s obvious Armstrong and his advisors were looking for more. Something that Celtic were not willing to give right now. I have been of the opinion that the club would like to see the same if not better from the player this season. Should that come to fruition he’ll have proved his worth for a better contract. As I said in in an earlier blog, Brendan deserves as much praise as the player. Another season will demonstrate how much he has learned and executed in consecutive seasons. Are Celtic being tight fisted? I don’t think so. If Armstrong comes up with the goods again this season I would expect he can write his own contract. If offers were as fruitful as reported down south then why is he still here? Celtic could just cash in on him now and move on to another project. The club aren’t short of midfield talent and I see this as a sign he wants to stay and the player is wanted. I don’t imagine this new contract is of the length or income he was looking for. So in order to get that, another year (possibly with extra bonuses) will allow both parties to negotiate a better deal. Personally I don’t think any player can make big demands after one good season. Not unless it was written into your contract or you are hot property, doing it on the park all of the time. Don’t forget he was average for a season and a half before Rodgers came in. Sure he was out of position, but I’m sure more will be expected from him. I’m glad this middle ground has been reached and both the player and the manager can concentrate on the football again. Armstrong is a fabulous talent but we’ve yet to see the best of him yet. The ecstasy from last night’s 5-0 defeat of Astana courses through my veins still. 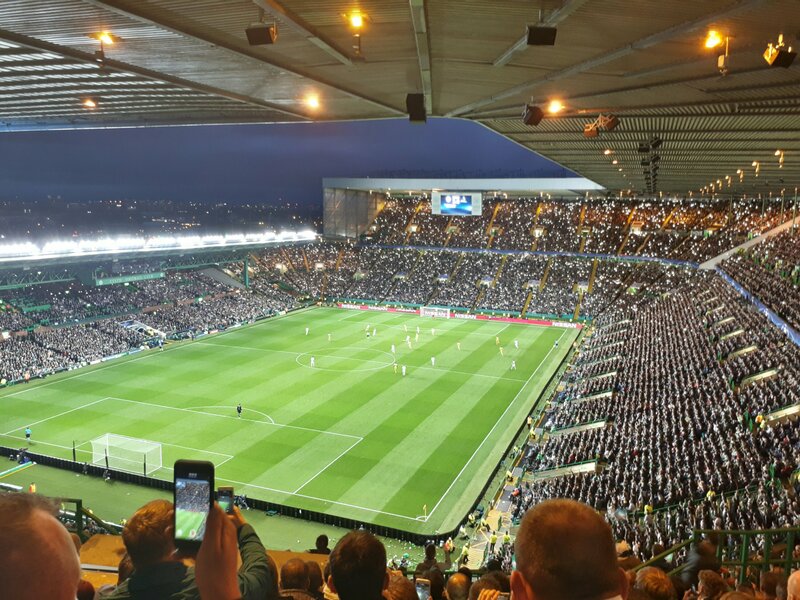 Celtic Park was jumping and significantly the Green Brigade were back among the supporters and helping to raise the roof once again. 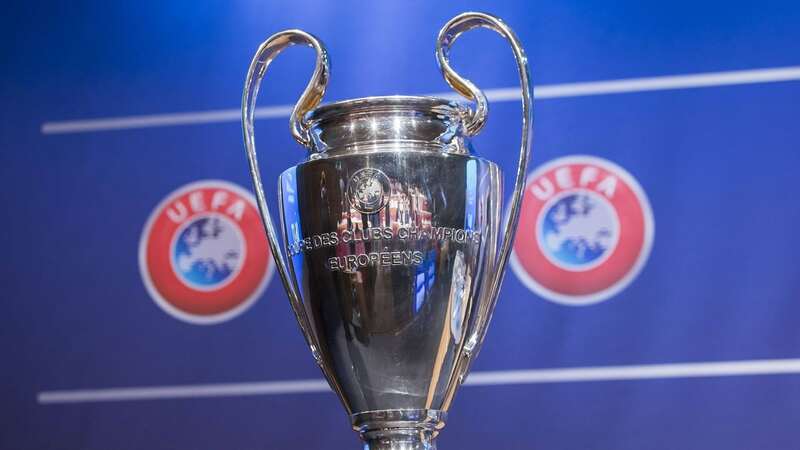 This significance of the playoff was to secure entry into the group phase of the Champions League once more and the guaranteed income that comes with it. In truth this was something more, it was about teamwork. This was Celtic’s eighth game of the season, and their fifth in Europe. Not everything has been rosy in the garden though. With injuries to key players, Brendan Rodgers has been deprived of both central defenders and strikers. That has meant using alternatives from within the squad, alien to the roles required. Then there has been the matter of player sharpness. Form has been sporadic at best, but last night that all changed. After an opening thirty minutes where Astana looked at comfortable and organised, Celtic began to click. It was as though someone had flicked a switch and suddenly all the misplaced passes, missing runs and misfiring in front of goal ceased. A two or three goal victory without reply was a target but it was better. Much better than we had hoped for. Good fortune came Celtic’s way but not without digging deep and working together. That was the key to this win. The joy among the players was just as apparent as it was in the stands. The atmosphere was electric as the goals rolled in one by one. We were all concerned about narrowly beating Astana last season. This session we knew we were a better team, but we still had concerns. Bitton filling it at centre back and Forrest and Sinclair both off the boil. They came good though and then some. The players all seemed to acknowledge that things had kicked in again. We saw that from stands and we rejoiced in unison. What a great feeling. What a great night. With the hard part done, all we need now is for Paddy to sign, Armstrong to re-sign and a decent draw after our place is confirmed. Well, two-out-of-three wouldn’t be bad!